20 SAT Vocabulary Word Jumble Puzzles: A great activity, game, or bell-ringer! Want to teach SAT-level vocabulary in a memorable and engaging way? Look no further. These word jumble puzzles will hook the attention of your students and teach them not only the vocabulary essential to the SAT, but many other words as well. These 20 puzzles each contain an SAT vocabulary word and the corresponding definition. Students then have a specific amount of time to find as many other words as they can, using only the letters present in the vocabulary word. The student with the most words at the end of the time limit wins! Don't worry - this resource includes a full answer key for every puzzle. 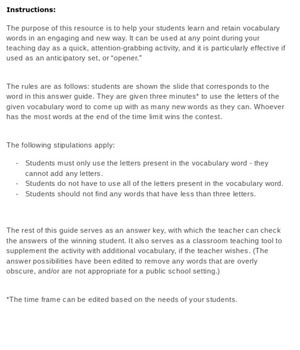 It's even been edited for a high-school level of knowledge, so the possible answers include only words that are not overly obscure or inappropriate for a public school setting. Additionally, I've only included words that are specific to the newly updated 2016 version of the SAT. 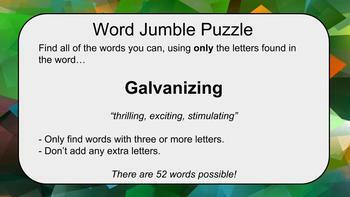 - A PowerPoint and Google Slides presentation for each word puzzle. - An answer key with the full game instructions. My students had a blast with these puzzles, and I know that yours will too!